We've added sweet potato to a traditional Jewish pancake. Serve as an appetizer or as a side to a main course. 1. 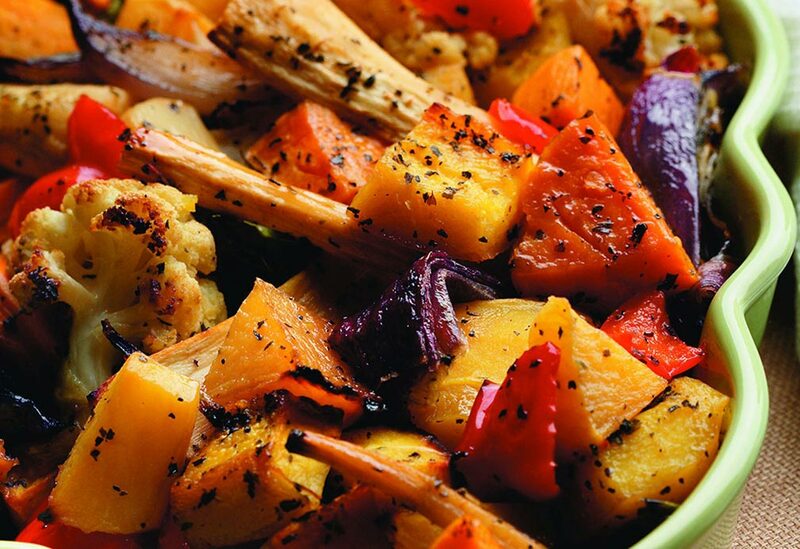 In a sieve set over the sink or a bowl, combine potatoes, sweet potato, and onion. Using your hands, firmly squeeze handfuls of grated potatoes to remove as much liquid as possible. Transfer to a large bowl and add rice, eggs, brown rice flour, baking powder and salt. Mix well. 2. Preheat oven to 250 °F (120 °C). 3. In a large, wide skillet, over medium-high heat, heat just enough canola oil to cover the bottom of the pan in a thin layer. In batches, using 2 Tbsp (30 mL) of the mixture per latke, drop latkes about 1 inch (2.5 cm) apart in pan. Flatten to 1/4-inch (0.5 cm) thickness with the back of a spoon. 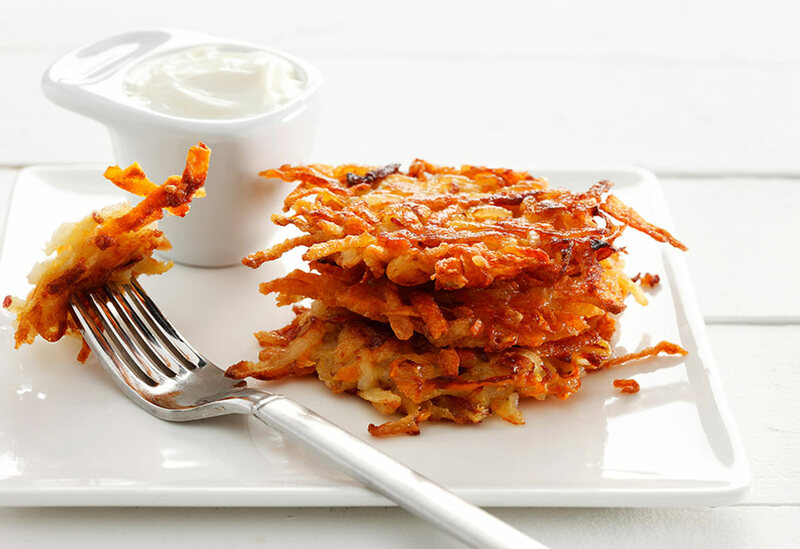 Fry for 3 to 5 minutes per side, using 2 spatulas to turn latkes once, until crisp and golden. Drain and place on a parchment lined baking sheet. Place in preheated oven to keep warm. 4. Repeat with remaining mixture, adding canola oil and reheating pan between batches as needed. Serve hot. 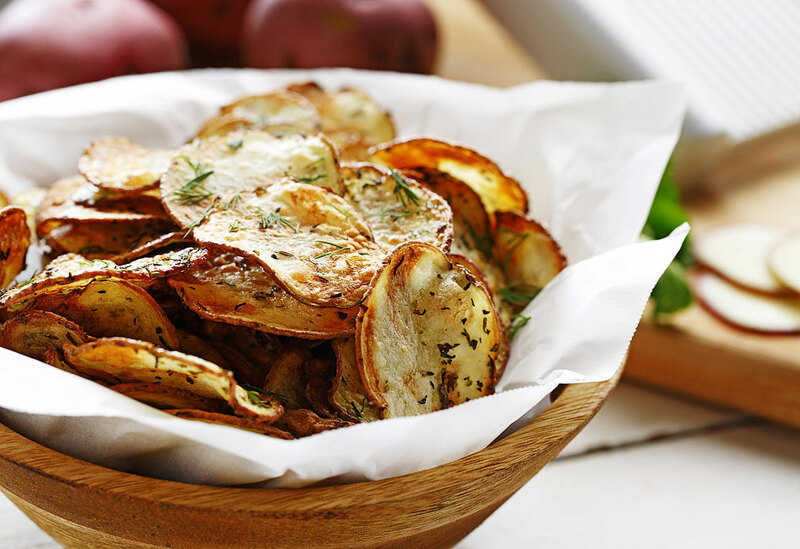 Tips: Select a high-starch potato variety, such as Yukon Gold or Russet. To check that canola oil is at the correct temperature, drop a small amount of the mixture into the hot canola oil. After 1 to 2 minutes, it should be golden in color. Remove any small cooked bits from the skillet between batches, if necessary. Canola oil is one of the healthiest vegetable oils, It has no trans fats and lowest saturated fat level of any commonly used vegetable oil. You can have your potato chips and eat light too!